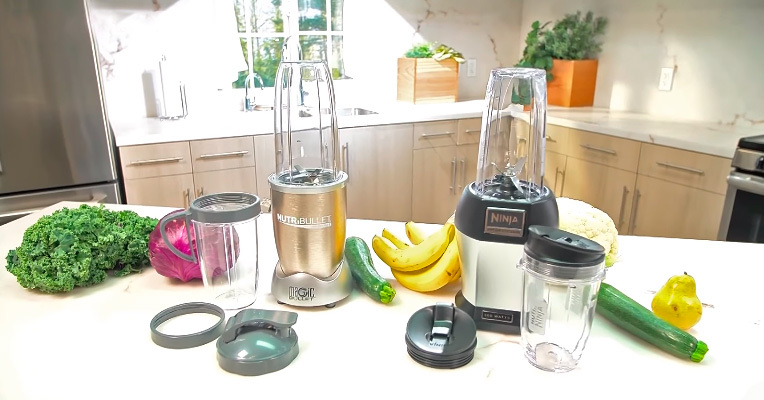 When it comes to choosing a high-quality personal blender, most of you will probably choose between NutriBullet and Nutri Ninja compact countertop blenders. Falling into the category of “bullet” blenders, these two brands are the most popular in their class. Hence, it’s no wonder that you face a debatable issue which of the two is better. Let’s try to answer this question together through the direct comparison of bullet blenders from both brands. The Nutribullet brand belongs to Nutribullet LLC. The company is devoted solely to personal blenders production. However, it is not simply a manufacturer of home appliances. At Nutribullet LLC, they focus on healthy living principles and promote healthy eating habits as part and parcel of a normal daily regimen. They position blenders not only as a handy kitchen appliance but also as a helpful tool that will make it easy to acquire and maintain the healthy eating habits, and even offer the whole philosophy how to incorporate healthy eating into your lifestyle. 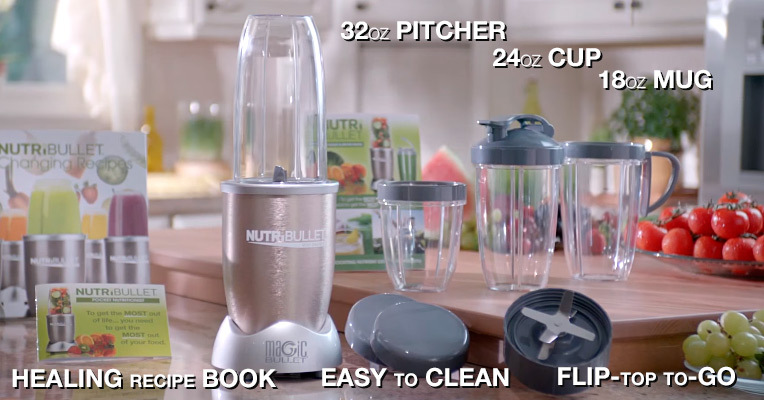 The NutriBullet product range is limited only to 4 models. Yet, all blenders are meticulously designed and engineered to extract maximum nutrients from ingredients and let you get the most out of your food. The models vary in price-tags and specifications and range from no-frills smoothie makers to smart Bluetooth-enabled blenders so they can satisfy the needs of the most exacting customers. In addition, the company offers a whole variety of brand-specific superfood mixes created by professional dieticians and health specialists to complete your diet with essential components. To make it easier for novice users to get started, the manufacturers provide detailed information on how to use a NutriBullet blender and a great number of recipes on their official website. Nutri Ninja is a sub-brand of SharkNinja LLC. Under the Shark brand, the company produces a variety of cleaning units, while Ninja covers kitchen appliances. Nutri Ninja stands exceptionally for compact or so-called personal blenders. Apart from those, Ninja range also includes full-scale blenders, food processors, multi-cookers, and coffee makers. At SharkNinja, they are focused on meeting quickly changing modern kitchen needs to make cooking rather an enjoyable and hassle-free task than an annoying duty. Hence, the manufacturer packs all of its kitchen appliances with power, technological solutions, and helpful functions to let you cook with ease and pleasure. Designed with the needs of all healthy lifestylers in mind, blenders from the Nutri Ninja series provide users with a quick and simple way of turning healthy food ingredients into nutritious and easy-to-digest smoothies. Today, the series includes 5 models, 4 of which feature the intelligent Auto IQ technology that combines blending sessions allowing you to achieve perfect results. 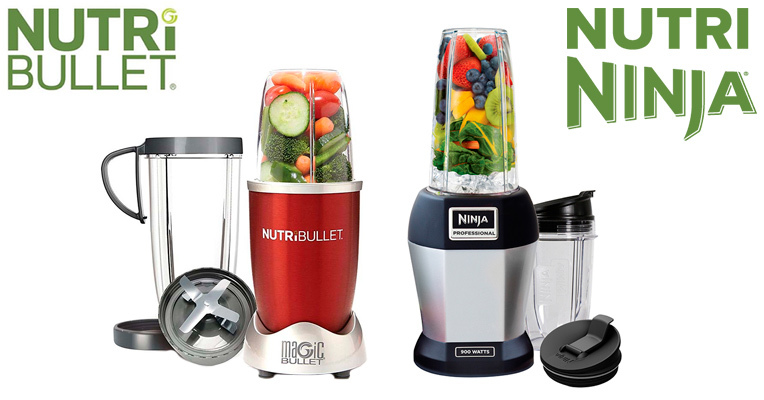 Before we start getting into details and revealing the major differences between NutriBullet and Nutri Ninja personal blenders, a few words should be said about the category of bullet blenders both brands belong to. A bullet blender is basically a compact size blender initially created for those who live vibrant and busy lives, yet, who want to stay healthy through drinking smoothies. The unit normally consists of a power base and an oblong cup and in assembly reminds a bullet, hence is the name. Such design was selected for a reason. Not only is it compact and portable but also easy to use and maintain. Meanwhile, the compactness in no way compromises the unit power which is often comparable to that of full-size blenders. For the sake of fair competition and unbiased estimate, we take two most popular bullet models from each brand having similar power and functionality characteristics. These are the NutriBullet 900 and the Ninja Pro. In detailed reviews, we will disclose all the benefits and downsides of both models to further compare the brands by their essential basic features. Though the NutriBullet Pro 900 is not the latest model in the manufacturer’s product range, it still remains one of the best NutriBullet blenders. The blender comes equipped with a 900-watt motor which is not the highest power rate among NutriBullet blenders, yet, it is enough to deliver the torque rate of 25,000 RPM and beat through both solid and soft ingredients with ease. The patented 2-blade stainless steel system proved to be extremely durable and efficient. It allows not only blending but also shredding, grinding, and chopping ingredients. A rugged sharp blade paired with exceptional motor force will let you pulverize and emulsify whole fruit and vegetables, fibrous herbs and wheatgrass, dry seeds, and solid nuts to a homogeneous consistency, and even crush frozen ingredients into a consistent slush. A specific feature of NutriBullet blenders, including the NutriBullet 900, is that they do not simply blend but rather break fibrous ingredients down to their most absorbable structure. If you compare a smoothie made in a larger blender with the one pulverized by the NutriBullet 900, the difference will be obvious. In contrast to a watery drink with a squashed pulp you’ll get using a conventional countertop blender the NutriBullet will produce a really smooth drink with a fine silky texture. Moreover, it will extract all the precious vitamins, nutrients, and minerals encapsulated in pulp and transform them into the most digestible form. Speaking of the NutriBullet Pro design and usability, they are second to none. As intended, the unit is compact and won’t take much space on your countertop if you want to have it within easy reach instead of stowing away. The whole construction is fairly simple, no confusing buttons and switches. All you need is to press the cup into position on the power base and twist it to activate the appliance. The blender will do the job for you while you'll be able to enjoy its hands-free operation. When you achieve the desired consistency, you will need to twist the cup in the opposite direction to stop extracting. Because NutriBullet blenders are very popular, they are offered in several different packages and may include various accessory sets determining their functionality and usability features. With regards to the Pro 900, all packages include a capacious 32-oz cup allowing for making several drink servings in one go. You may also find packages that will contain two 32-oz cups and those with a few cups - one large and a couple of small ones. Also, there are packages that contain a 24-oz cup for smaller portions of drinks and an 18-oz cup for grinding and blending sauces. Other accessories usually include flip-top to-go lids allowing you to conveniently drink your concoctions right from the cup (or store the remaining drink in the fridge), regular lip rings, and handheld lip rings for easy cup handling. The downside of the NutriBullet 900 some customers claim is lack of speed modes that help tackle dry ingredients packing or easier achieve smooth consistency when blending soft and tough ingredients together. Yet, you can do the same with the NutriBullet by simply using pulsation or tap technique. Besides, a recipe book will provide a number of interesting dishes (not only smoothies) and a pocket nutritionist guide will help you maximize the nutritional value of your meals. If you search through Ninja blenders reviews, you’ll find out that the Nutri Ninja Pro is among top-selling blender models. Similar to the NutriBullet 900, it comes fitted with a nice 900-watt motor that generates a great amount of force to quickly liquify soft ingredients or grind dry ingredients to a fine powder state. Yet, the torque the motor delivers is somewhat inferior to that of Nutribullet at 21,000 RPM (still a decent characteristic), meaning that you will need to pulverize a little bit longer to get the desired smoothness. The latest Pro model has a 1000-watt power, with the torque being unchanged. The Pro Extractor 4-prong blade assembly is super solid and highly durable, making the blender suitable for extensive daily use. 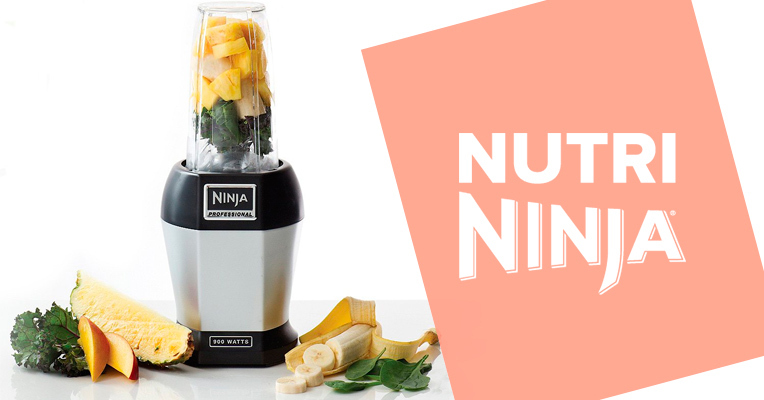 Whether you need to chop, shred, grind, or blend juicy, soft, fleshy, fibrous, tough, or even frozen ingredients, the Ninja Pro will cope with the task. It can easily crush through dry seeds, fibrous skins and stems, and solid ice, turning those ingredients into a smooth and homogeneous puree. The Nutri Ninja Pro follows the same principle of operation as the NutriBullet 900 where you have to screw the blade onto the cup and press the cup in an upside down position into the power base. The blending is also activated by twisting the cup. But you will have to hold the cup twisted all the time while blending. Actually, the only biggest downside of the Nutri Ninja blender is that it doesn't provide hands-free operation, which some people may find inconvenient. 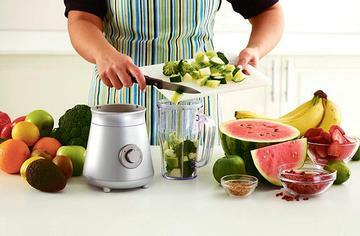 The Nutri Ninja design is also compact and portable. 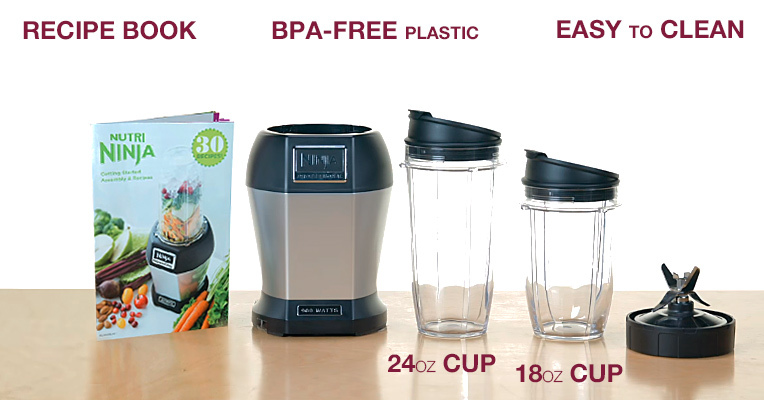 The body, cups, and lids are made of premium quality BPA-free plastic safe for food and easy to clean, while the blade is made of hygienic first-grade stainless steel resistant to rust and oxidation. 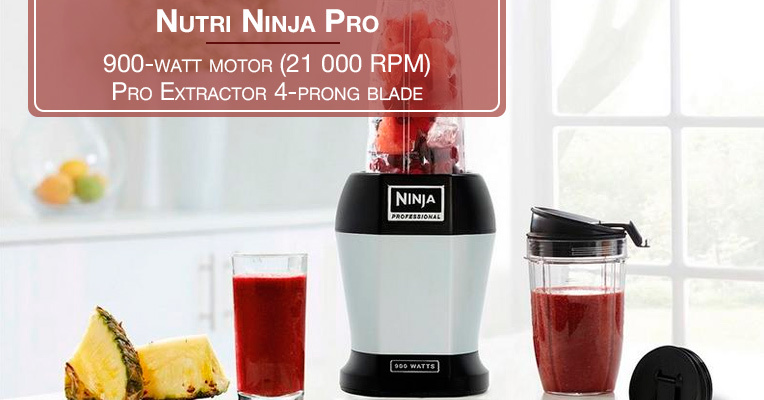 The Nutri NInja Pro comes in a standard package, including a power base, an extractor blade, two blending cups, and two sip-and-seal lids. The cup capacities are 24 oz and 18 oz accordingly. These are rather single-serve cups. A bigger one will go for drinks and smoothies, while a smaller cup works great for sauces, pastes, dips, or simply some smaller drink portions. Though the unit is also complemented with a recipe book, the selection of recipes is rather basic in comparison with NutriBullet's collection. Also, you will not find any nutritional recommendations there. 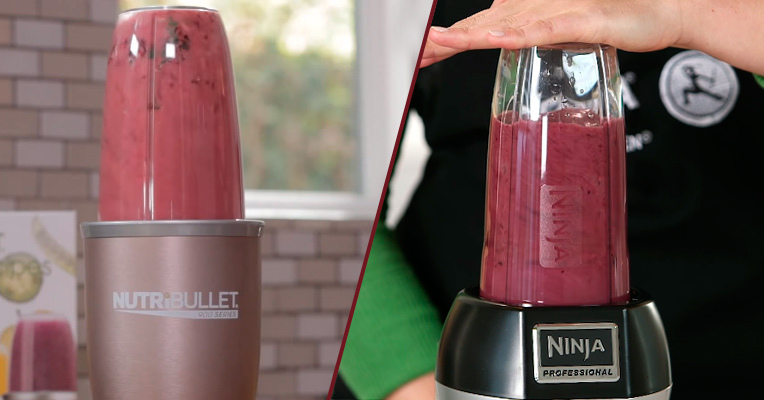 Both NutriBullet and Nutri Ninja are top-selling compact countertop blenders, each having their own fans. On a first glance, they seem to have almost the same specifications, but on closer investigation, it's easy to see that they aren't identical. There are a few remarkable characteristics that decide which task and purpose each of them is most suited for. 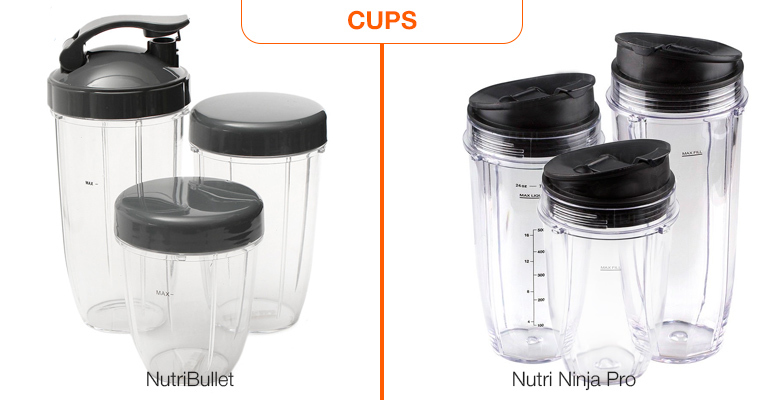 Hence, we've compiled a component-to-component comparison which will reveal most distinct differences between NutriBullet and Nutri Ninja blenders. The motor power is a purely technical aspect that directly determines the appliance performance. The more powerful motor your blender features, the smoother and finer blending and emulsifying results you will achieve and the sooner you will get them. 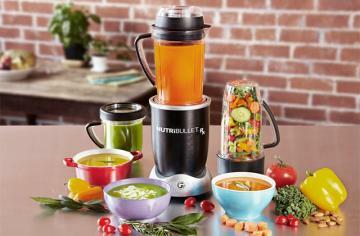 When it comes to NutriBullet and Nutri Ninja bullet blenders that are primarily intended for making smoothies, the blender motor power will tell you what kind of ingredients you will be able to process with this or that model and how the chosen blender will handle such ingredients like nuts, leafy greens, ginger, mango, coconut, etc. With these thoughts in mind, both manufacturers fitted their blenders with hefty motors. 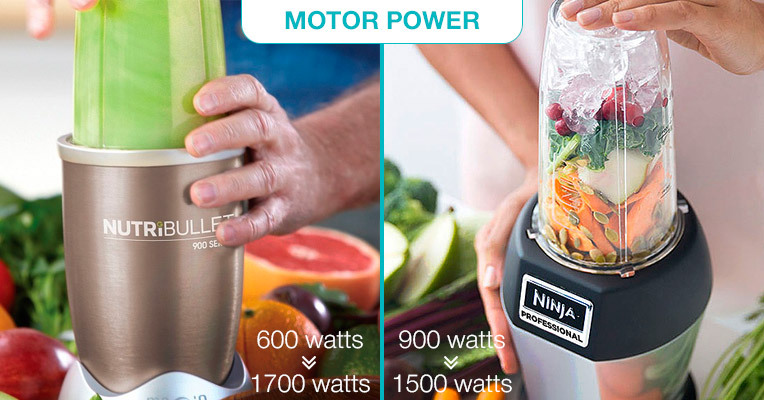 The motor power rates in the NutriBullet product range vary from 600 W to 900 W to impressive 1700 W. The lowest power rate will be good if you plan to make predominantly basic smoothie recipes. 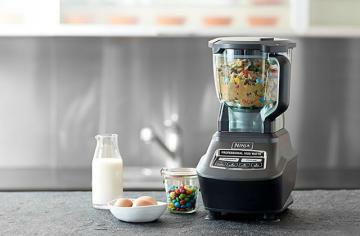 The highest rate (1700 W) will let you tear and crush through literally any ingredients and cook all kinds of smoothies of any consistency and a whole plethora of other dishes - from soups, sauces, mayonnaise, shakes, and cold drinks to ice-cream, desserts, pancakes, and instant cereals. Yet, the downside of high power is that while providing extremely quick blending sessions, the fact that liquids and emulsions tend to heat up during blending may reduce the content of useful nutrients and vitamins in fresh concoctions. Hence, 900 W is an optimal power to keep all healthy elements inside your food and have the functional versatility you need for your cooking routines. Nutri Ninja blenders power rates start from 900 W and go up to 1500 W which means that both brands are reasonably similar in power aspect. A blade is another key component of any blender that contributes to final blending results and overall performance of the appliance. 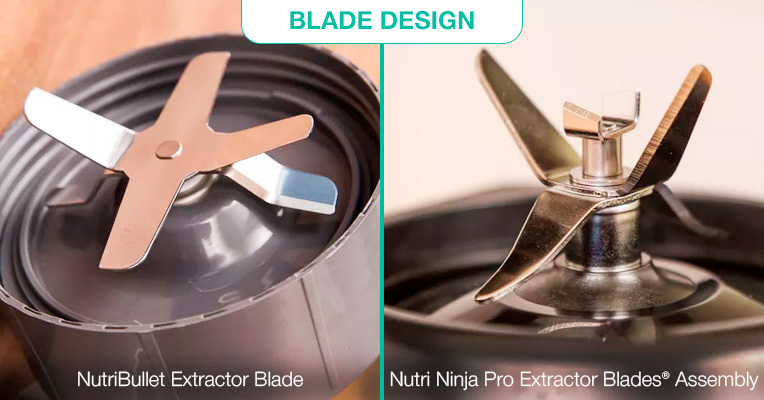 Both NutriBullet and Nutri Ninja blenders stand out for their highly durable and long-lasting blades made of first-grade stainless steel. They perform great on all types of ingredients, be it soft and juicy fruit, fleshy vegetables with tough skins, nuts, ice, fibrous greens and herbs, or berries with seeds. Yet, the blades differ in design, and that, in turn, leads to slightly different blending results. 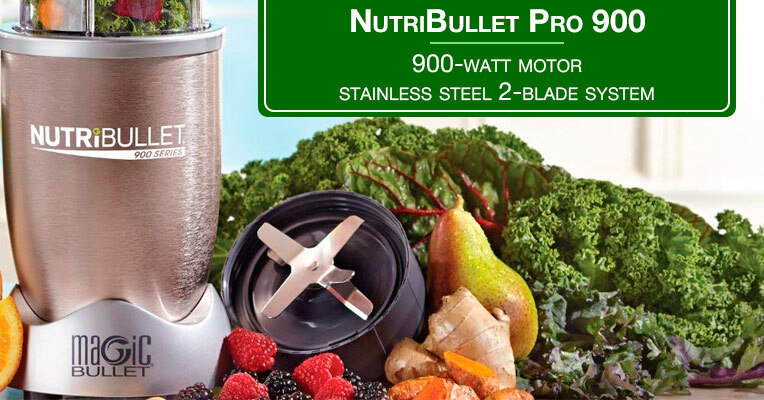 NutriBullet offers a patented blade system called an extractor blade. A four-prong blade is rather flat and features square-shaped tips. It is installed over a two-prong blade with downward tilted prongs. Thanks to high-torque rotation generated by the motor, such blade design allows creating a strong cyclonic action for a smoother and maximum homogeneous texture, meanwhile crushing all ingredients to the finest paste or liquid state. 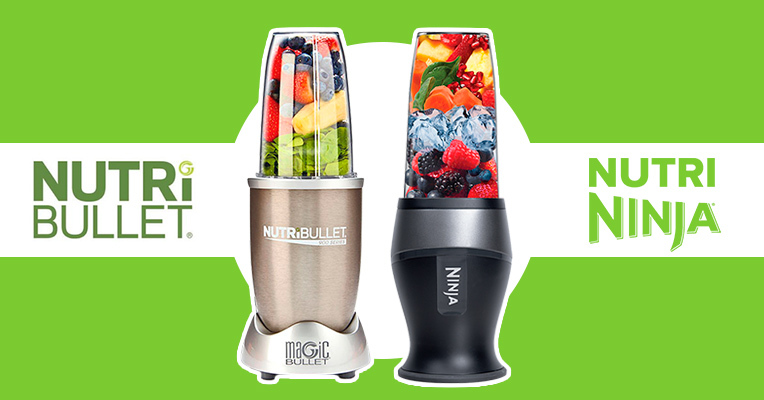 Nutri Ninja blade system is designed to blend both to the top and to the bottom creating a kind of vortex. The blade features 4 prongs with sharp tips. Two prongs are tilted downward, the other two are pointed upward at a narrow angle. This construction works better for chopping and shredding than for emulsifying. Both brands provide cups in 3 sizes including a smaller 18-oz cup, a medium-sized 24-oz cup, and a larger 32-oz jar. NutriBullet cups are wider and look more capacious at a glance. They are made of BPA-free non-toxic heavy-duty plastic, resistant to shocks, damages, and temperature drops. Nutri Ninja cups are taller and slimmer. Made from BPA-free Tritan plastic, they are also strong and highly durable. Cups from both brands are dishwasher-safe, intended for extensive long-term use, and come fitted with a number of flip-on lids for storing drinks or sipping your healthy treats on the go. Many customers report that Ninja cups are easier to fit into the majority of cup holders, while Nutri Ninja lids offer better sealing and more convenience for spill- and leak-free drinking, which is especially important when you drink your smoothie or juice in a hurry. Since NutriBullet and Nutri Ninja are almost similar in technical specifications and have a distinct competitive advantage over other personal blender producers, it still might be pretty difficult to choose one until you see both blenders in action and evaluate their actual performance. There have been handled many practical tests to see how both blenders perform on different types of tasks. Initially meant for making smoothies and thick nutritious drinks, bullet blenders functionality is not limited to this single task. These units can perfectly cope with a whole variety of other jobs and can be used for making ice-cream, butters, side-dishes, salsas, dips, sauces, grinding spices and coffee beans into a powder state, as well as chopping. To sum up test results, we should state that both NutriBullet and Nutri Ninja blenders fulfill the job they are designed for exceedingly well. Yet, there are certain tasks where one brand outperforms the other one and your final choice should go down to considering the kitchen tasks you primarily need the blender for. Thus, NutriBullet is hard to beat when it comes to liquifying and juicing. The NutriBullet smoothies will come out really smooth and silky without any grit. In terms of taste, Nutri Ninja smoothies are in no way inferior to those from NutriBullet. However, Nutri Ninja drinks will still contain some tiny, almost microscopic particles of unbeaten pulp and some large piece of seeds, hard skin, and nuts. When it comes to juicing, NutriBullet will deliver thick juice reminding the one you’ll normally squeeze with a masticating juicer, while Nutri Ninja will rather produce a foamy and fibrous pure with a layer of separated liquid on the top. On the other hand, Nutri Ninja delivers times more efficient results when you need to chop or grind ingredients. Homemade pates, butters, minced meat, and salsas will come out just perfect. In general, both brands fall within a reasonable price segment and won’t hit your budget. Though NutriBullet and Nutri Ninja blenders are not the cheapest on the market, they are not the most expensive either. Taking into account their functionality, performance, and longevity, they are worth every cent you'll pay. 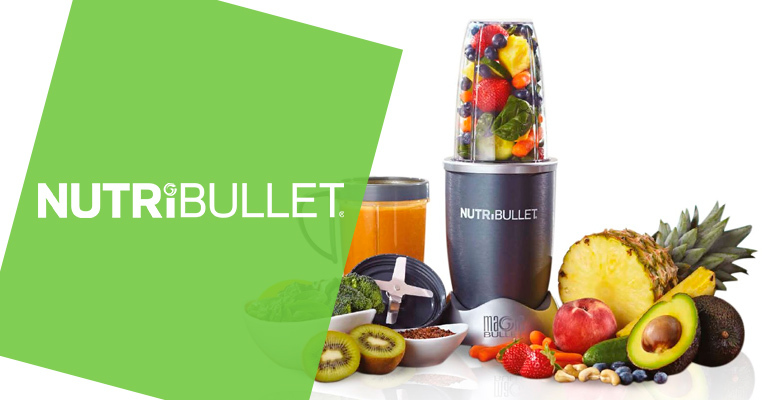 If we compare prices by models, NutriBullet will turn out to be more expensive, but at the same time, you'll get a richer package in most cases. Having regarded all essential issues and aspects normally inducing us to make a decision, do we not have a conclusive answer to the question "which bullet blender is better?" Strange though it might seem, we should say it depends. If we omit some differences in design, ease and convenience of use that are not of much concern in both brands, the most important feature that appears decisive in most cases is the performance. 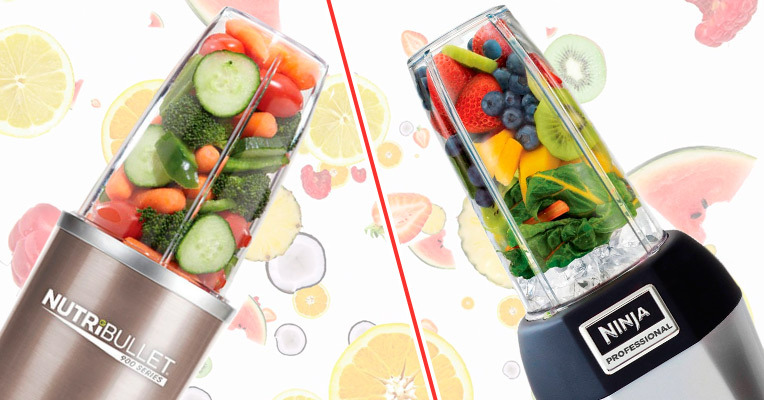 In terms of overall performance, you can be 100% sure that with both brands, you’ll get a powerful and functional blender that will deliver consistently good blending results. The thing is that in practice NutriBullet and Nutri Ninja blenders appear suitable for specific needs. Thus, a NutriBullet will be a real find for all smoothie enthusiasts and keen healthy diet followers who love protein shakes and energy-boosting thick drinks. Meanwhile, Nutri Ninja blenders will be perfect for any home cooks. With the help of these blenders, you'll be able to grind meat, make a variety of appetizers, and even knead dough. These blenders rather excel in grinding, chopping, and shredding than in emulsifying and liquifying. All in all, both producers use different approach. While NutriBullet offers a kind of complete well-balanced nutrition program supplementing blenders with extensive nutritional support, Nutri Ninja provides a high-quality kitchen appliance, backed by a huge production experience and primarily designed to serve basic kitchen needs. No matter what brand you choose, you can be sure that you'll get a high-quality product.